Instagram didn’t invent photo sharing, video sharing, or the photo messaging it launched today. With 150 million users, it doesn’t have to be first. It just wants to be the best, making new experiences accessible to as many people as possible, but with style. You might say Instagram steals these ideas, but that would put it good company. It’s what people say about Apple. Instagram was never really original. From the days when it was Burbn, it’s been a mashup of other apps with an extra coat of gloss. Back then it was Foursquare meets Hipstamatic. Checkins and photo filters. It dropped most of the Foursquare part, and added a Twitter-style unfiltered feed. Twitter felt real-time, and Instagram did too, but by showing images in-line, it was more visually appealing. Eventually Instagram was acquired by Facebook and incorporated its new parent company’s photo tagging system. It would then jump on the video bandwagon where SocialCam had come and gone, and Vine was just taking off. Instagram jacked Vine’s tap-and-hold-to-record-multiple-clips interface, but polished it with filters and cover images. 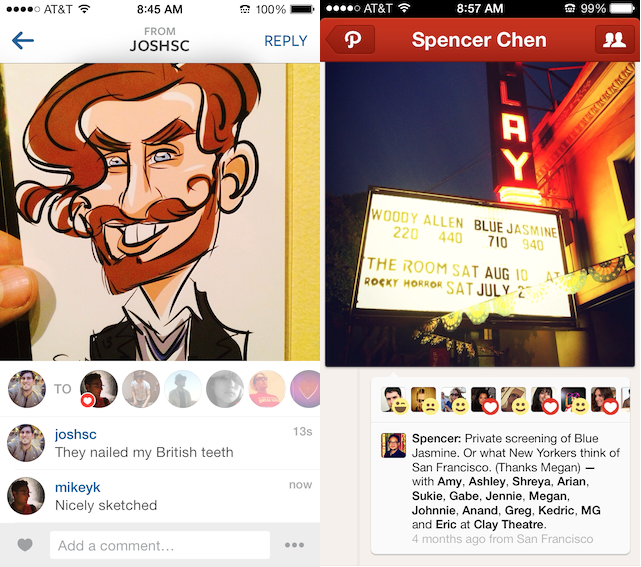 And today, Instagram’s launch event was practically an homage to other apps. Instagram Direct, its new private photo and video messaging backchannel, is all about communication through photos and videos, like Snapchat. Except with Instagram, you can filter and refine your media before you send it. Its messaging permission system is a hybrid of Twitter’s DMs where you can get messages from people you follow, and Facebook’s Other Inbox that collects messages from people you might not know. This gives you the best of both worlds, where you’re protected from spam but don’t have to get an explicit two-way friendship confirmation and won’t miss messages from new people you meet. 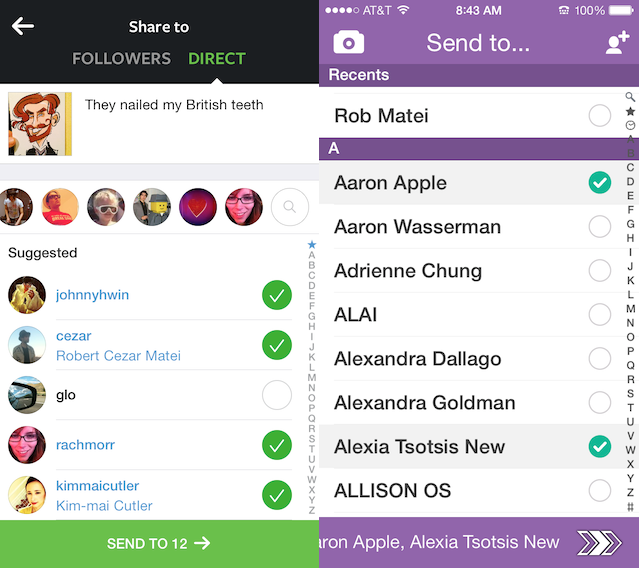 The look of Instagram Direct seems lifted straight from competitors. When you add recipients, you tap little bubbles next to their name just like Snapchat, and a counter appears along a bar at the bottom. The comparison screenshots above show how similar they look. And when friends like your Instagram Directs, their little heart bubbles appear in a row beneath the photo like on Path. The thing is, most of Instagram’s 150 million monthly and 75 million daily users have never used Snapchat, which has “over 30 million users”, or Path, which has around 20 million registered users. People sometimes say “it doesn’t matter until Facebook/Google/Apple does it” about copying features, and in the photo world, you might be able to add Instagram to that list. Founders of Instagram’s competitors might feel flattered today, but they should probably be worried too. Because this “follow with finesse” strategy worked wonders for Apple. There were gangly, awkward music players before, but the iPod made listening elegant. PC laptops were clunky and ugly, and the MacBook made them sleek and modern…for a price. Confusing PDAs and tablets were bested by the friendly iPad. Each time, Apple disrupted an industry by bringing rough, niche, but functional ideas to a mainstream audience that values form. Next we might see Apple take what others have done with TVs or watches and make them feel like a more natural extension of ourselves. That’s a diplomatic answer, and while it might not be his intention, some might say Instagram is running short on innovation now. But nothing’s changed about its approach. That doesn’t mean it will succeed like Apple. Messaging is a crowded market, and Instagram is a very late-comer. All its design flourishes can sometimes weigh it down, making it seem slower than raw but nimble competitors. It will take time to see how the visual communication market on mobile shakes out. And Instagram has time. Thanks to Facebook’s resources, even if monetization is slow to start up as CEO Kevin Systrom said today, it has all the money for development and expansion that it needs. Instagram can afford to play the long game, and it stands to get some fresh legs. As Systrom noted, there are 4 billion feature phones in the world and just 1 billion smartphones, but the shift is happening. The developing world will deliver a landslide of new photographers. When they arrive, Instagram doesn’t care who it’s compared to, as long as it works and feels like the camera of your dreams.